Kasargod, Oct 3, 2017: Clashes broke out between CPM and BJP cadres in Kasargod district ahead of BJP national president Amit Shah’s visit to North Kerala. Police sent in reinforcements after stone pelting and fisticuffs were reported from Pallikkaram in Nileshwaram on Tuesday morning. 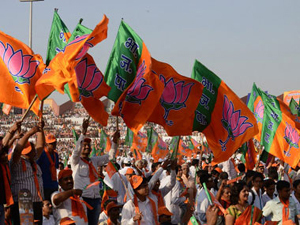 The saffron party alleged that on Monday night around 20 CPM workers attacked its workers as they were setting up flags and buntings at the Market Junction on the national highway as part of the Janaraksha Yatra to be flagged off by Amit Shah later Tuesday. The BJP leaders said its Trikaripur mandalam secretary Vijayakumar, Nileshwaram municipality president Sukumaran, BMS zonal president P Krishnakumar were injured in the attack which took place around 9.30 pm Monday. Krishnakumar suffered injuries to his head and fell unconscious, the party said. A motorcycle was also vandalised. The injured were admitted to a private hospital in Mavungal. Leaders of the DYFI, the youth wing of the CPM, Anoop, Pranav and Sanoop led the assault, the BJP alleged. Earlier, the BJP’s mandalam secretary of Kaliyassery in Kannur Sajeevan was also assaulted, it said. Just cannot understand what o they get by doing so ? destroy Peace of the particular pace ?